First of all, I should say that this side of India is doing just fine ? so far. The news of the earthquake and tsunamis hit home in a really surreal way, as I spent more than two hours on the Arabian Sea on Sunday. 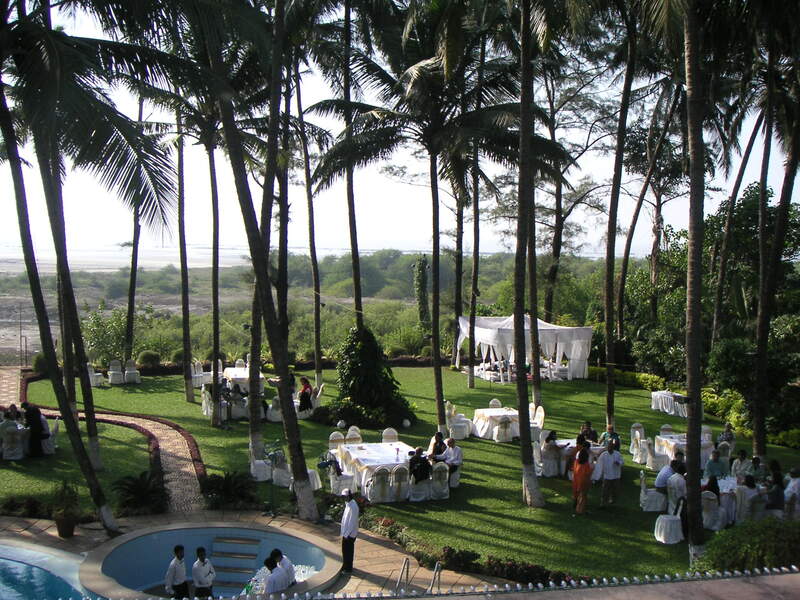 We were invited to a wedding in the coastal town of Alibag. For transport, the bride and groom arranged for a charter boat to ferry us from the Gateway of India to the wedding site. It’s wedding season in India, and most especially in Bombay, where it hasn’t rained since November 2 and it won’t again until May or June. The bandstands and cricket fields along Marine Drive and the causeway from South Mumbai up to Bandra are framed by hot pink archways and, by night, are flooded with lights and guests. Drop by any of the hotels in the afternoon and evening, and you are guaranteed to see a stunning array of women in beaded saris and men in fancy kurtas and long, fringed scarves. And, Tuesdays are almost as popular as Saturdays, because many couples, regardless of religious or social background, call on astrologers to determine their marriage timings. My Hindi teachers told me some time back that it isn’t uncommon to invite an entire village to a wedding and that, when you send out an invitation, “plus 1” or “plus several” is implied. We have already gotten a few invitations from people we know only casually, so we decided we’d show our faces of at least one. I was more than happy to oblige, as I’ve been dying to go to an Indian wedding ever since seeing Monsoon Wedding. Yeah, I know it’s clich?. 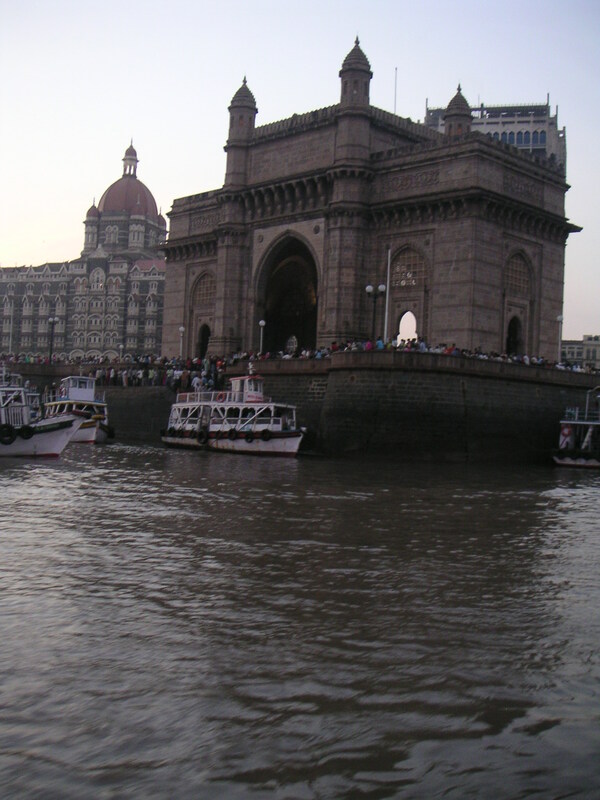 The Gateway of India is the last place you want to go if you’re dressed up for a wedding. As beautiful as the landmark may be, the area around it is a busy, noisy, smelly tourist thoroughfare, where giant balloon salesmen and boat tour reps accost you at every turn. 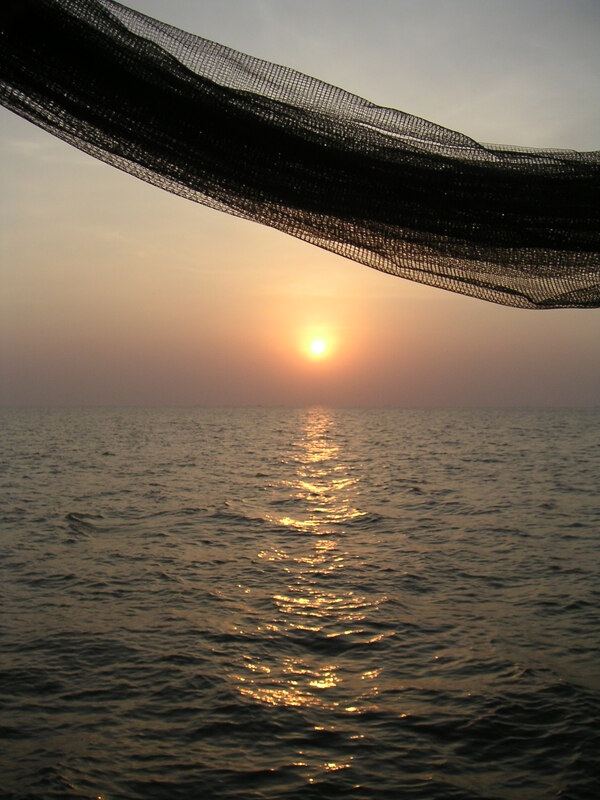 Luckily, we didn’t have to wait long to board the boat to Alibag. An hour later, we arrived to a caravan of buses and vans waiting to drive us the mile or so to the wedding. On the dusty road along the way, we drove past a well-attended cricket match, parched farms with hut-shaped bales of hay, herds of goats, and a few stray dogs, cats, and cows. Then, we came to an oasis. The home where the wedding was held was situated on land that could well have been a botanical garden. Hedges grew around weathered busts of Hindu gods and tall palms cast shadows on the lawn. It was so typical of what I have come to expect in India: small paradises in the least expected places. Meanwhile, the two-story house was straight out of Architectural Digest, complete with marigold-draped columns, minimalist Halston-on-safari d?cor, and a curved pool in the backyard with views of the sea. This couple was blessed with good karma, serious cash, or a lot of both. The wedding itself was very casual. The groom wore a pinstriped linen suit, while the bride wore a two-piece gown with a turquoise, fishtail skirt and an embroidered and hand-beaded bustier in turquoise and peach. The attire alone made me reconsider Western weddings, which, in comparison, are so boring and stuffy. The setting, too, was really relaxed. Tables and chairs were set up on the lawn, while, in the corner was a bohemian lounge with oriental rugs and circular cushions covered by a wispy, cotton canopy. The bride and groom exchanged rings in a ring ceremony by the pool, and that was the extent of the rites for the day. The rest of the time was spent eating morsels of tandoori chicken, sipping Sapphire and tonics, and dancing. Not a bad way to spend Boxing Day. As for the tidal waves, we only learned of them on Sunday night after returning from our trip, which, of course, included two, hour-long ferry rides. It’s scary to think that the ripples could have hit us, but they didn’t. The sea was completely tranquil and the breezes and sunset were perfection. Though, I remember thinking that the water looked strangely rippled and glassy. Bombay hasn’t always been so lucky. My neighbor told me this morning that a similar disaster occurred in 1945 when a less severe earthquake hit coastal Pakistan, sending waves to Muscat, Oman, and Bombay. Being on a fault line, India has endured a number of seismic shifts, even as recently as 2001, when Gujarat suffered a quake. In fact it was yet another disaster on the 26th. Numerologists are having a field day. No doubt, we are very fortunate that Bombay was spared. At last check, the death toll from the quake/waves is at 21,000 and climbing, and at least 7,000 (one-third) of the number of dead were in India. 21,000 in one day. And that number could likely double through epidemics. Donations can be sent to the following address or wired.